with the hopes of being plug and play but the marker lights and reverse spot light aren't working. 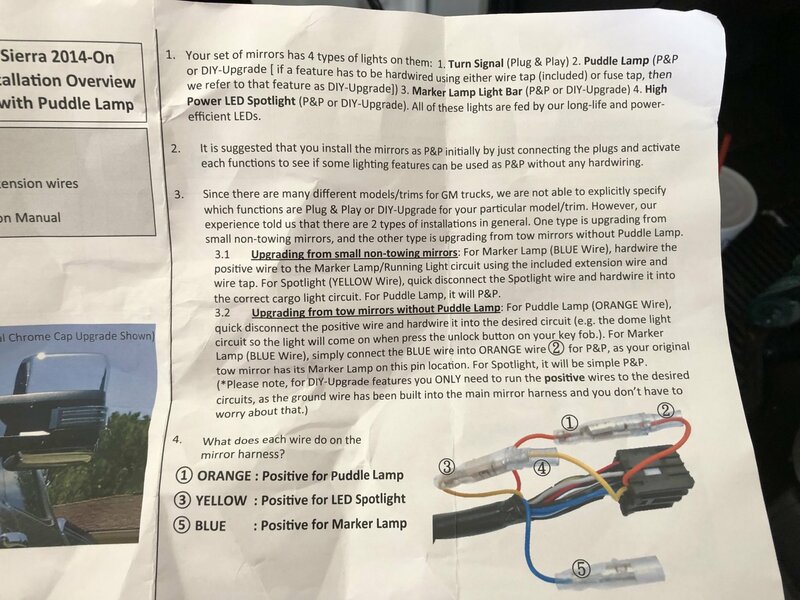 The instructions aren't the greatest and wiring isn't my specialty. Has anyone installed these? 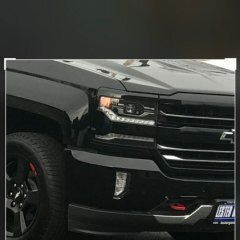 My truck is a 2014 LTZ, came stock with power fold mirrors, with puddle lights and turn signals in the mirrors. Thanks! This is what it came with. I bought similar mirrors from trail-ridge only function I don’t have is power folding/memory. I didn’t use there wiring, I purchased new wiring harnesses from Pgamboa making it plug and play. I ran my ground wires to the ground in the door. From there I ran the spots to the cargo lamp fuse on the passenger side and the marker light wire goes to the fuse under the driver side for marker lights. I like the cargo switch better. I have extra light to the rear when loading stuff in the dark. Besides the lights don’t put out enough light to actually assist in backing up. I’d actually think they’d be annoying. That and I have an opt7 triple under my tailgate that puts out enough light and then some for backing up . You need to re pin the door harnesses there is a thread on this. And a member Pgamboa can send you full door harnesses or a DIY kit to re pin your own which I did. Everything will work like factory. Anyone put tow mirrors on their '18 1500 LT? 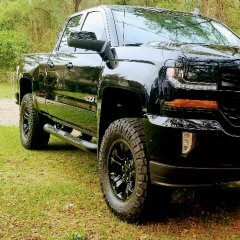 I have an '18 LT Z71 and I'm wondering what all I would have to do wiring wise to get the turn signals and everything to work. My current mirrors are only power adjust and heated. I have some eBay tow mirrors and I replaced the clearance lights with the smoked lights from boost auto parts. I have the clearance lights set up to be on with my clearance lights and when my clearance lights are off they function as a blinker. I have a clearance light failing once again... ugh. 4 if the 8 leds are out. I’ve replaced my left and right and now my left is failing. The lights are expensive and seem to always be having issues. I’m not sure if I want to try another set from boost auto or if I should try a different brand. I want to keep smoked lenses in them, definitely don’t want amber. I’ve heard good things about the boost auto mirrors so idk if I just got a bad set but with so many of them having issues in such a short time (less than a year) it makes me wonder. Do y’all know of any better manufactures I could get better clearance lights from or could it be the way I have them wired?